The Museum of Contemporary Canadian Art (MOCCA) launched their summer exhibition last Friday with a big party featuring “the smooth summer sounds of Toronto synth-rock-pop combo The D’Urbervilles” as live entertainment. Hopefully ironic press-release writing aside, “Pulp Fiction” brings together fourteen Canadian artists you might not usually see in a mainstream gallery. Assembled here, in this rather traditional art venue, the works come together in what looks like your typical gallery showing. Gracing the walls and plinths in an orderly fashion, the works are approachable and virtually pretense free. This is a show that, for the most part, seems to honestly want to show you a good time. However, there’s a disconnect that sets in about half-way through the exhibition. There’s something you can’t pin down that’s preventing you from really taking it in. Jennie O’Keefe’s suite of sculptural dolls. 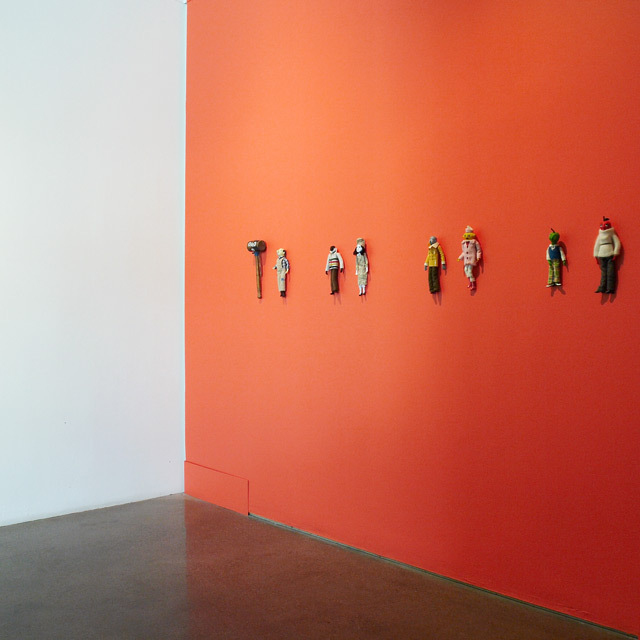 It starts off just fine; visitors to the show are first greeted by Jennie O’Keefe’s series of wall-mounted dolls. These tongue-in-cheek mashups of fruits, animals, inanimate objects, and Ken doll–sized outfits bearing names like Miss Meringue and Roofin’ Rufis, set the playful and rather irreverent tone of the exhibit. With the show concentrating heavily on drawings, the pieces you find next are inviting, graphic, and sometimes down-right hilarious. There’s even a common thread to hang on to as you make your way through the exhibition; almost every single work in the show is figurative. It’s a unexpectedly traditional and narrow parameter for a collection of works from such a sizable group of young, progressive artists. Everything seems to either grow out of, or revert back to, the human form in one way or another. It could just be that any show focused on drawing will have this common figurative foundation; it seems to sit firmly at the core of contemporary illustration. 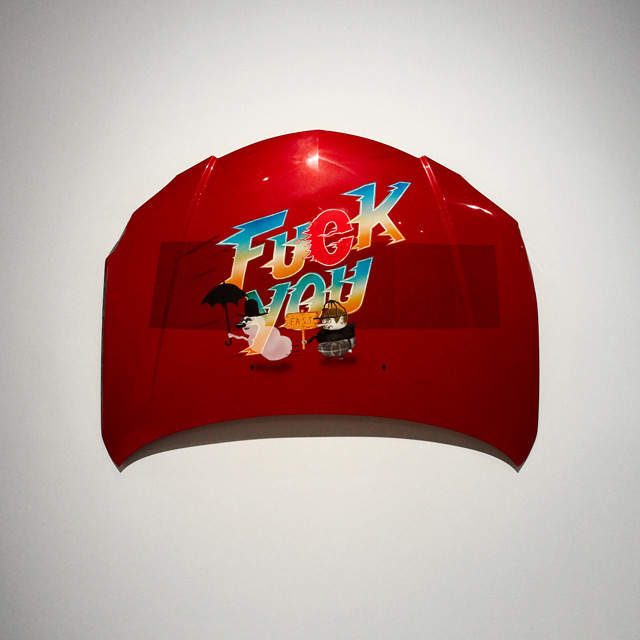 Seth Scriver and Shayne Ehman’s air-brushed car hood. Seth Scriver and Shayne Ehman contribute a video piece with accompanying paintings to the mix. 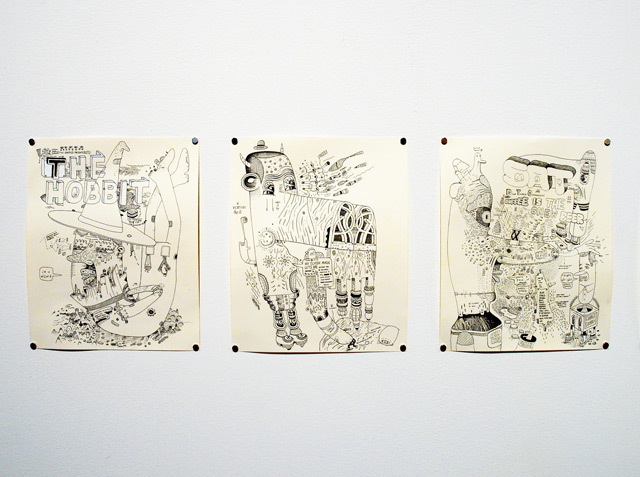 Their video, Asphalt Watches, is a quirky cartoon in three episodes, projected on a large scale. On the opposite wall, Air Brushed Scenes from Asphalt Watches on Car Hoods is just that; characters from their movie painted on the disembodied hoods of hot-coloured cars. The video runs simultaneously with a second film on the other side of the main space, and each fills their half of the gallery with constant sound at a volume that demands your undivided attention. Whether or not this inescapable soundtrack adds to or detracts from your viewing experience is debatable, but who says art has to be viewed in silence? The clear stand-outs of the show are Marc Bell and Peter Thompson; the two artists who seem to have best established their distinctive style. In “Pulp Fiction,” they exhibit both individually and collaboratively, displaying their separate dedication and combined intensity. Marc Bell shows a series of etchings, drawings, and paintings executed with a relentless precision that borders on compulsion. They are just so detailed and so dense that you can’t help but think about the length of time that it must have taken to create them. It almost seems like that piece of information should be posted on the wall alongside their titles and media. His works have a storybook quality to them. You investigate each of them as if you’re trying to follow a narrative and figure out the plot, but, ultimately, they’re too surreal and scattered to make any logical sense of. Thompson’s suite of painted illustrations are surreal portraits of characters you only wish you could dream up. They’re layered with fine and subtle details that have to be taken in, one by one, as you try to add it all up into a singular impression. But it seems almost like too tall a task. Marc Bell and Peter Thompson’s The Hobbit Series. Unexpectedly, it’s when these two incredibly talented artists come together in The Hobbit Series that you realize what’s keeping you locked out of “Pulp Fiction.” Executed in ink on paper, each one is rich and wondrous. Even the smallest objects in the background are personified, playing their part in the larger story. Nothing is unimportant and everything is worth your time. And after the first few, you wander away. There’s a reason why this collective, collaborative movement of self-made creatives is a relative stranger to the traditional art gallery. It’s not the right venue. The works in this show are operating at an entirely different pace than the viewer. They each demand much more time than you can bear to give. Asphalt Watches alone is forty minutes long. A visitor views Peter Thompson’s painted series; edited to demonstrate what two-second intervals look like. In the gallery, you can only stand there looking for so long, and for this overwhelmingly dense exhibition, it’s not long enough. This disparity leaves you feeling like you’ve glossed over the real content and are constantly missing the punch line. As much as you may like the work, you may not like the experience. Fortunately, MOCCA has invited comics and novel store The Beguiling to host a satellite retail location in the entrance of the gallery. With everything from zines for less than three dollars to high-production artist monograms, it’s a relief to have the option of taking something with you to look over later and give its due time. “Pulp Fiction” runs until August 23.